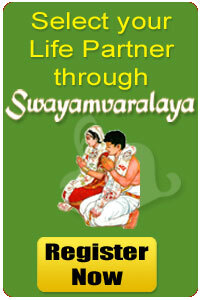 Registration with Swayamvaralya - Access our website - search bride / groom profile. (Vice Versa) Upload your photos and give Show Interest get your life partner. Registration with Swayamvaralya - Access our website - search bride / groom profile. (Vice Versa) Upload your photo Search your life partner. Registration with Swayamvaralya - Access our website - search bride/groom profiles (Vice Verse)- Upload your photos - Search your life partner. Share Messages with registered members. Special highligting your photo on your profile and front page dynamically. Note : Your account will be activated only after ensuring receipt of payment.